Hello, and welcome back to our blog! Here at Balboa Victory Dental Office, we are dedicated to providing the best dental services possible to as many people as possible. With this in mind, we feel that it is our duty to not only help our current patients but all Encino area residents by providing valuable dental information through our blog. In our previous post, we went over some uncommon foods that are beneficial to a person’s overall health. In today’s post, we are going to continue along this same vein while also cover some essential vitamins and minerals that work to improve the integrity of a person’s teeth. Keep Reading below to learn more about this fascinating subject. Making sure that your oral hygiene is as excellent as possible can be difficult for some. For the most part, we assume the average person doesn’t think too heavily about their teeth during the day. After the morning brushing routine is over, most people probably forget about their teeth until it is time to brush them again. However, taking a little bit of time during the day to consume some of the substances we have listed below can go a long way in making sure that your teeth stay as healthy as possible. Vitamin D: While everyone is quite aware of the fact that calcium is essential for healthy teeth, fewer people seem to know that Vitamin D is also essential for healthy teeth. Vitamin D is produced naturally in the body when skin is exposed to sunlight and is also included in many fortified foods and drinks. Research has shown that an increase in Vitamin D consumption has been linked with tooth remineralization, meaning that teeth are better able to repair themselves the more Vitamin D there is in a person’s system. Probiotics: The gastrointestinal benefits of probiotics have been noted for decades, however, recent studies are starting to show that probiotics might also help to improve people’s oral health. These studies show that probiotics help to fight off the harmful bacteria in a person’s mouth, reducing the chances of developing tooth decay and gum disease. Fermented Cod Liver Oil: There are many supplements available on the market that can help with a person’s oral hygiene but some people have found that consuming fermented cod liver oil has the same effect as these supplements. This oil is high in Vitamins A, D, and K and also contains a blend of other important nutrients including omega-3 fatty acids and fat-soluble vitamins. 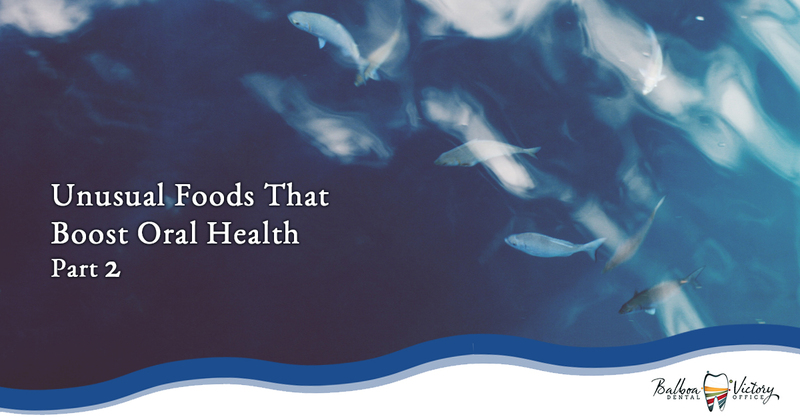 We hope that this short blog series has been informative and that you have learned a little more about foods that can work to promote positive oral health. As always, if you would like to learn more about our dental office, or you would like to schedule an appointment, please visit our website or contact us today. At Balboa Victory Dental Office, we will work with you to make sure that your oral health is as optimal as possible.